Vibrating Screen Cloth consists of semi-permeable barrier made of connected strands of metal, fiber, or other flexible/ductile material. Mesh is similar to web or net in that it has many attached or woven strands. Wire Mesh, also known as screen is a large regulatory category of wire fabric. It is made out of chemical fibers, silk, metal wire through certain weaving methods. It has wide applications in the industry, agriculture, science and technology and national defense. Up to the most advanced technology, high-tech industries, down to daily life and culture, wire mesh screen develops simultaneously with the national economy, and plays an important role in the peoples’ daily life. Wire mesh, or screen is mainly used in: Aviation, aerospace, printing, dyeing, electronics, mining, pharmaceutical, food, food processing and chemical industry.Vibrating Screen Cloth has basically four functions: Screening, filter, Printing and strengthening. In addition, woven wire mesh can be used to make quarry screen in petroleum industry, as acid washing mesh in chemical and chemical fiber industry, and electro galvanizing industry, it is used as sifting screen for solid particles and powder, or as filter media for liquid and gas in the industries such as metallurgy, coal, petroleum, chemical, pharmacy, automobile, porcelain, glass and so on. 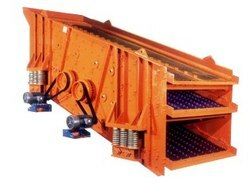 Indo German Wire Screen Co. are one of the reputed names in the industry that manufactures and offers clients with unmatched range of Vibrating Screen. Our range is manufactured using premium grades of metals and offered in specifications as required by clients. These Vibrating Screens are in accordance with the required industry standards and made available at competitive prices. Meshes are often used to screen out unwanted things, such as insects. Wire screens on windows and mosquito netting can be considered as types of meshes. A huge quantity of mesh is being used for screen printing work. Meshes are also used as drum heads in practice and electronic drum sets.